Twenty-year-old Ingeborg Strand is certain she is destined to be an old maid. She's had several suitors but none she deemed worthy of spending her life with. That is, until she meets a university student from Oslo, and feelings stronger than friendship begin to develop between them. But tragedy strikes, and the future begins to look bleaker than ever. 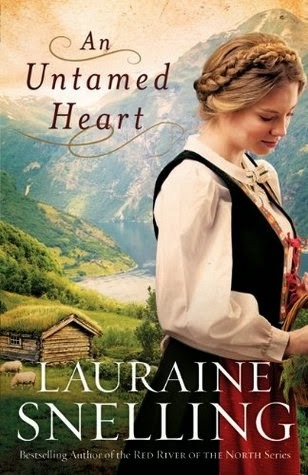 It isn't long before she meets Roald Bjorklund, a widower who has been planning to go to America for some time, lured by the promise of free land. He's a good man, a hard-working man--and he has a young son who desperately needs a mother. He's clearly interested in Ingeborg, but is he the answer to her prayers? And what about love? This isn't how she's always imagined it. I absolutely adore Lauraine Snelling's Red River of the North Series (think, Little House on the Prairie for adults) and, when I found this prequel, I ordered it and it jumped to the top of my TBR pile. There are a number of things in this book that I enjoyed. Snelling spends a great deal of time talking about life in 19th century Norway and a great deal of this takes place at the family's seter (the mountain pasture...I will admit I had to look that up as Snelling never really defines it for the reader). I have an interest in this topic anyway, so it kept me interested in the book. I also enjoyed knowing what Ingeborg's life was like before coming to America and how she met Roald. Ultimately, though, this book did not live up to my expectations. While I had no "big" problems with the book, there were several smaller issues that bothered me. For one thing, it is a little thin on plot--I don't think this bothered me as much as it might another reader because I enjoyed the details Snelling included. I also felt like, as a prequel, this just didn't work. The Ingeborg in this book is not like the Ingeborg I remember in the Red River of the North books. And the one thing that ties this Ingeborg to the Red River series isn't even introduced until the last, oh, 30 pages of the book! Another issue--and this is common for nearly all fiction genres--Snelling just has far too many characters in this book. I could not keep the secondary characters straight and, finally, just gave up trying. I think if I had read it before reading any of the Red River of the North books, I might have a more favorable opinion of it. But, even though this book wasn't for me, it does make me want to reread the Red River of the North series.